A new, more modern design, with smoother flow. Different versions for use with clients and for use in the back office. Different versions customized for iPads, and customized for PCs & laptops. With this modern, new edition of the 403(b) Contribution Planner®, you can now provide superior compliance, sales support AND customer service, with the technical thoroughness and reliability that Still River is known for. 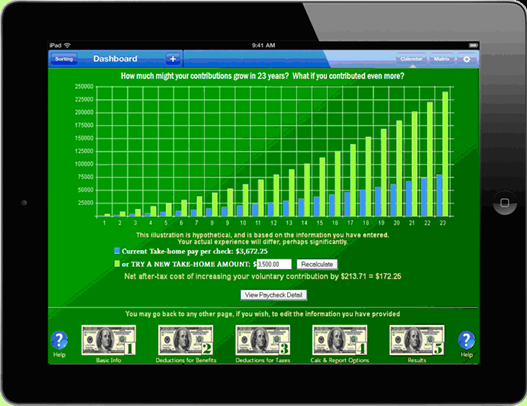 Designed for traditional web browsers, but automatically adjusts for iPad and iPad Mini screens. An efficient, back-office version for professional use. A consumer version agents can use in the presence of clients, or that can be licensed for direct client use. Our customary technical accuracy, and detailed explanatory output, including printable, savable PDF reports. 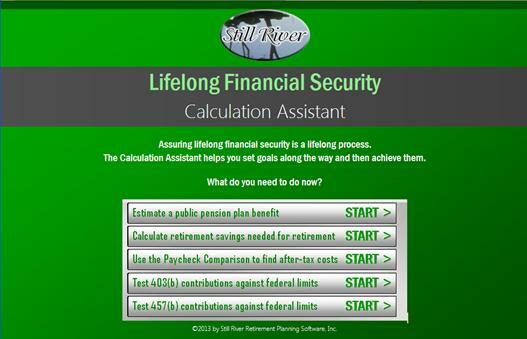 All the key calculators you’ll need for 2015: State retirement plan benefits, Retirement needs, 403(b) limits, 457 limits, Paycheck comparison. You select the ones you need. Link to them from an iPad, and they will automatically adjust!